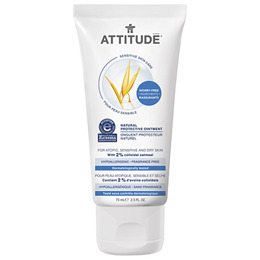 ATTITUDE’s Natural Protective Ointment forms a waterproof, protective film to restore the skin’s barrier. It keeps the good moisture in and irritating humidity out! For atopic, sensitive and dry skin. Hypoallergenic and with 2% colloidal oatmeal. Cocos nucifera (coconut) oil, butyrospermum parkii (shea) butter, ricinus communis (castor) seed oil, hydrogenated soy polyglycerides, avena sativa kernel flour (colloidal oatmeal), avena sativa (oat) kernel oil, C15-23 alkane, bisabolol, rosmarinus officinalis (rosemary) leaf extract, helianthus annuus (sunflower) seed oil. Apply this water-repellent protective barrier on the affected area at least twice a day or as directed by a specialist. The use of gloves and other personal equipment may be used to increase protection, especially when the skin comes into contact with water. 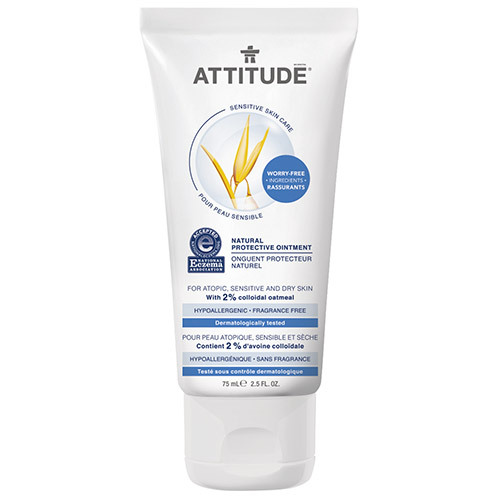 Below are reviews of ATTITUDE Natural Protective Ointment - 75ml by bodykind customers. If you have tried this product we'd love to hear what you think so please leave a review.